The purpose of this article is to serve as a general strategy guide with tips and advice that you should follow when attempting to win a pizza eating challenge. There are many different varieties of pizza eating challenges all around the world, and they come in all shapes and sizes. Some challenges involve a thinner but larger diameter New York-style pizza, and others involve a thicker but smaller diameter Chicago-style deep dish pizza. Some pizzas are loaded with different toppings (supreme/deluxe) or they feature gourmet/specialty pizza options, and then others require you to choose just one or two toppings. Some don’t require any toppings at all, and you just have to eat a very large cheese pizza. Many restaurants have stipulations about meats vs vegetable toppings since meats are known to be tougher and heavier than veggies, and some even count two vegetable toppings as equal to one meat topping. Most pizza restaurants let you choose your own toppings but there are some that specify the toppings beforehand, and every now and then you’re allowed to make one or two minor substitutions. You may encounter five pound challenges but then there will be others that are six to eight pounds, depending on the thickness and diameter. Even though there are many different variations you might encounter, the basic strategy you need to have remains similar for every variation. Before we go into the specific strategy details for winning a pizza eating challenge, please make sure you have read and understand our Basic Strategy For Winning A Food Challenge article. It’s full of fourteen different general strategy tips that won’t be included in this article, which you need to understand before attempting your next pizza challenge. You may also want to check out our How To Win A Team Pizza Challenge article and video too since there will be similarities of course. Please start off by watching our very informative How To Win A Pizza Challenge video so that you can visually see all of our different tips put into practice during an actual pizza eating challenge. For this video, I attempted The 24″ Pizza Challenge at Toarmina’s Pizza & Burrito Joint in Ann Arbor, Michigan. 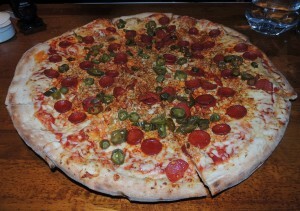 During this big challenge I had to finish a six pound 24″ one-topping New York-style pizza within the 1 hour time limit. Winners receive the meal free and their name posted on the Wall Of Fame. There had been only 2 previous champions!